Tiemoue Bakayoko and Franck Kessie pictured after the game. 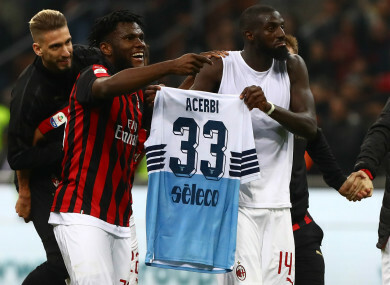 TIEMOUE BAKAYOKO AND Franck Kessie have apologised to Francesco Acerbi after they celebrated with the defender’s shirt following AC Milan’s victory over Lazio. Gennaro Gattuso’s side battled to a 1-0 win over Lazio on Saturday, with Kessie’s penalty enough to secure the full three points for the hosts in the battle for top four. Before the match, Bakayoko and Acerbi engaged in a media back-and-forth, which added some extra spice heading into the match. Following full-time at the San Siro, Kessie and Bakatoko celebrated their hard-fought victory by raising Acerbi’s exchanged shirt in front of their home supporters. This, unsurprisingly, angered Acerbi after the match with the 31-year-old making his opinion known to the public. The AC Milan duo then responded to Acerbi’s grievance, with both apologising to the Lazio star on social media in the aftermath of the incident. With the three points, AC Milan now hold fourth position in the Serie A table on 55 points while Lazio sit in eighth on a tally of 49. Gattuso’s side currently hold the fourth and final Champions League spot, with Roma, Atalanta and Torino all above Lazio in the table. AC Milan and Lazio are also set to meet again in the coming weeks with both set to face off in their Coppa Italia semi-final second-leg on 24 April. They battled to a 0-0 draw in their first meeting back on 26 February, but Gattuso’s men will be optimistic of another win following Saturday’s result. Email “AC Milan stars apologise for using rival's shirt to celebrate win”. Feedback on “AC Milan stars apologise for using rival's shirt to celebrate win”.